If there is anything Russia’s Yulia Belorukova, took away from the 2018 Pyeongchang Olympic Winter Games, besides an individual bronze medal in the classic sprint, it’s that she is capable of sprinting with the best in the world. Leading up to the Games in Pyeongchang, the 23-year-old had yet to land on a World Cup podium. Even post-Pyeongchang, a World Cup win remained unchartered waters for the recent Olympic bronze medalist. But with the opening World Cup classic sprint on Saturday in Kuusamo, Finland, Belorukova, is making a statement for the upcoming season. She raced to her first individual World Cup victory, besting Sweden’s sprint star Stina Nilsson–who crashed during the final corner before the finishing stretch–and last year’s overall sprint leader, Maiken Caspersen Falla of Norway. Belorukova had shadowed Nilsson during much of the final, but as they cornered toward the final 100-meters, a missed pole plant caused Nilsson to fall. Belorukova maneuvered around the Swede and crossed in a time 2:52.62 of for the win. Unable to recover from the fall in time for a shot at the podium, Nilsson crossed 12.33 seconds behind the Russian in sixth. Also lucky for the blue and gold, not all podium prospects were riding on Nilsson. Twenty-four year old Maja Dahlqvist of Sweden, who placed second in last year’s freestyle sprint in Dresden, Germany, advanced to Saturday’s final and claimed her second individual World Cup podium, crossing 1.12 seconds back from Belorukova. Following Dahlqvist, Sweden’s 33-year-old Ida Ingemarsdotter crossed third, 1.51 seconds back from the winner. The last time Ingemarsdotter landed in the top-3 individuall was in 2016, when she placed second in the freestyle sprint in Lenzerheide, Switzerland. 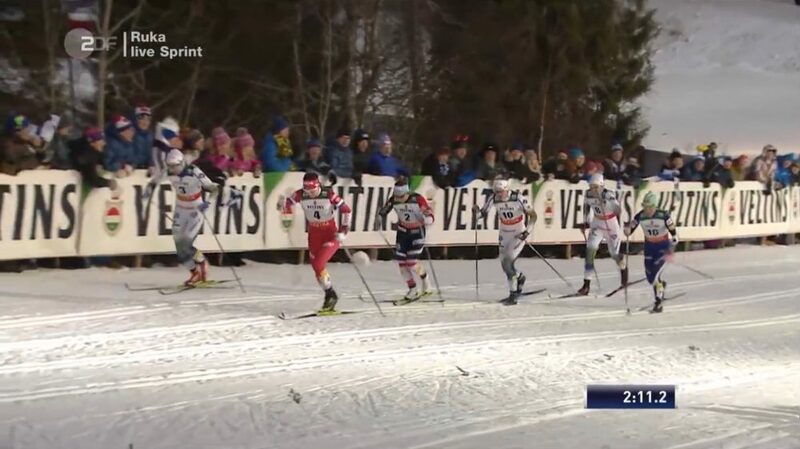 The finish was hard-earned, with Ingemarsdotter outlunging Falla by 0.1 seconds in a photo finish. Falla ended the day in fourth (+1.52) and Finland’s Krista Pärmäkoski in fifth (+4.71). Earlier in the day, Russia’s Natalia Nepryaeva won the qualifier in a time of 2:56.50. 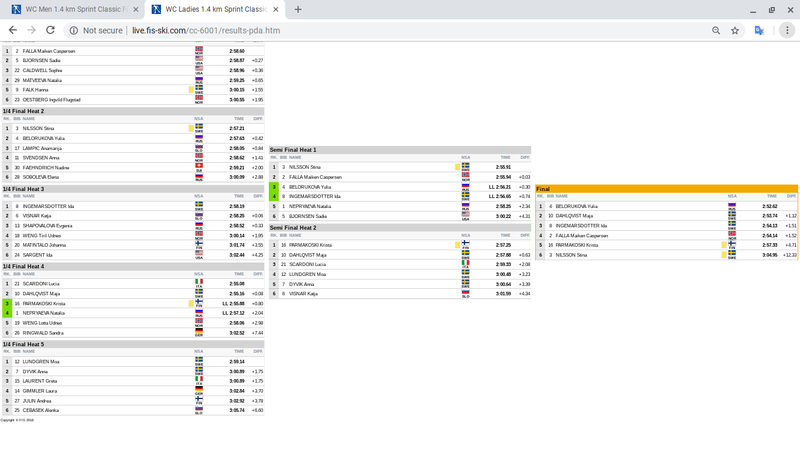 Behind her, three Americans qualified for the heats, with Sadie Bjornsen leading the charge in 5th (+3.01), Sophie Caldwell in 22nd (+6.97), and Ida Sargent in 24th (+7.23). Both Caldwell and Bjornsen were slotted into quarterfinal 1. The heat went to Falla, with Bjornsen snagging an automatic advance spot in second. Caldwell, who crossed the quarterfinal in third, did not advance to the semifinals, She ended the day in 16th. “It sure was fun to fire the engine for day 1 of World Cup racing this winter!” Bjornsen wrote in an email after Saturday’s sprint. “I always think of the first races as a Christmas gift… a total mystery, but completely exciting! Sargent raced quarterfinal 3, which was won by Ingemarsdotter. Sargent crossed sixth and did not advance to the semifinals, ending the day in 27th. Bjornsen moved into the first semifinal, lined up against Falla, Nilsson, Ingemarsdotter, Belorukova and Nepryaeva. Ultimately, she crossed sixth and ended the day in 11th. Bjornsen raced last weekend’s FIS 10 k in Beitostølen, Norway and placed third behind Norwegians Ingvild Flugstad Østberg and Therese Johaug in second and first, respectively. 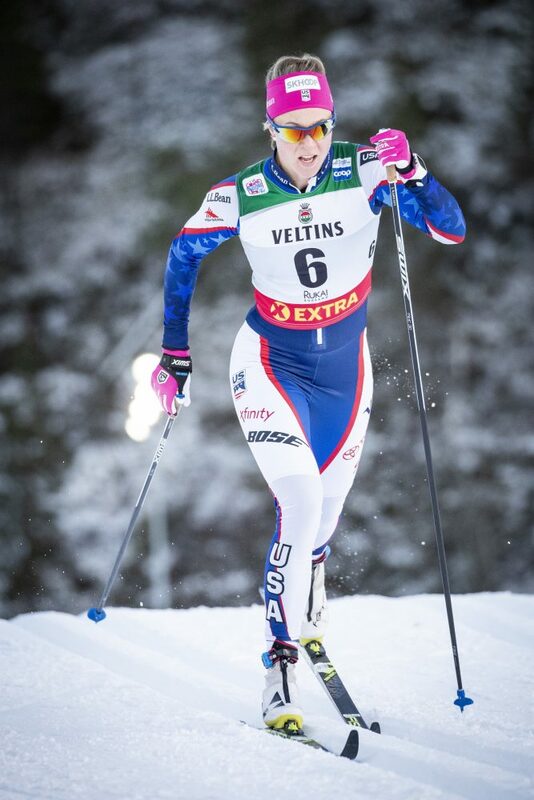 Finishing outside of qualification for the U.S. on Saturday was Jessie Diggins (USST) in 33rd (+9.05), Rosie Brennan of the Alaska Pacific University in 38th (+10.74), Kelsey Phinney of the Stratton Mountain School in 46th (+13.49), and last season’s overall SuperTour leader, Kaitlynn Miller of the Craftsbury Green Racing Project in 58th (+18.06). No Canadian women entered the race.